Aviansies are flying creatures found in the God Wars Dungeon. This guide is meant to help people who want to start tanking at Aviansies. For more information and more advanced tips please go to Aviansie section of the God Wars Dungeon guide. Aviansies are monsters that can be found in the God Wars Dungeon and are Armadyl's followers. People kill them for increasing their Armadyl kill count so they can fight the Armadyl boss. They also kill them for the good income and Ranged and Constitution experience. Income mostly comes from noted Adamant Bars (4), which they drop. These creatures are non-aggressive towards you if you're wearing an Armadyl item (more on that later). This equipment is recommended. It is suggested that you keep your range attack and defence bonuses around the numbers circled in blue. Don't forget climbing boots, unless you're using Trollheim Teleport. You need to climb rocks on your way to the dungeon from Burthorpe. Ring of Wealth/Ring of Life - On your first trip it's better to bring a Ring of Life just in case, but a Ring of Wealth will increase your drop of rune items. This might be bad, because those rune drops might replace the adamant bars. Your choice. Armadyl Pendant - If you don't know what it is, then look at the necklace around my neck; it's not a Pendant of Lucian! 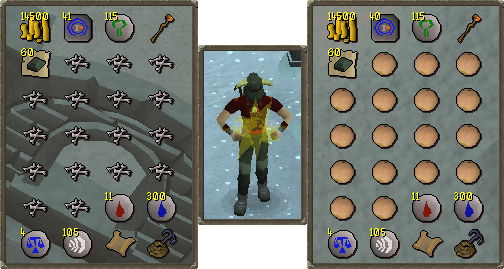 You will need this if you're not wearing anything else from Armadyl. If you don't wear one the Aviansies will be aggressive towards you. To get it you have to complete the Temple of Ikov Quest. If you chose a good way, you should already have it. If you chose a bad way, go back to the room where you got the staff and kill Guardians of Armadyl until they drop a Pendant. This is also what you do if you lost yours. Ava's Accumulator - You can replace it with a god cape for protection from certain gods followers, but this is recommended because it picks up your bolts. Saradomin Vambraces - Not needed but highly recommended because sometimes a Saradomin follower may attack you. The slot could be replaced with Black Vambraces and you could wear another Saradomin item like chaps or d'hide. You could also replace these vambraces with Zamorak ones, but you'd also need Sara D'hide top. Bolts - Broad-tipped or Adamant bolts work the best. They hit for about the same damage, but to use Broad-tipped Bolts you need 55 Slayer. Guthan Helm - Could be replaced with a Torag Helm. Torag Legs - If you wish to have less ranged defence and more ranged attack, than Torag Legs could be replaced with black d hide chaps. Most people pick this so they can eat less food. Helm/D'hide/Chaps - This can be replaced with Armadyl armour, which gives you an advantage by giving you the option to wear a different kind of amulet and having a bigger range attack stat. 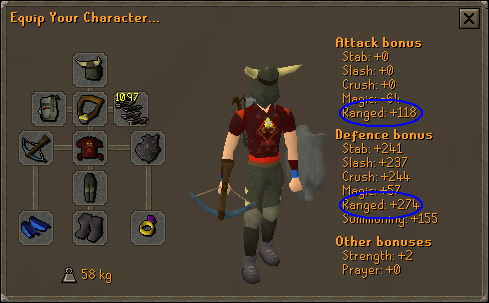 When you pick this kind of equipment, you should check again if you still have Zamorak and Saradomin items equipped. You could also use a holy/unholy book or Zamorak or Saradomin braces, but they give even less range defence. Zamorak D'hide - This is very expensive for people with little amount of money, but this will give you good stats with protection from Zamorak followers. You could replace it with Saradomin D'hide, but you will need Zamorak vambraces (Unless you use your own combo). Shield - Should provide strong melee Defence. Another option is the Obsidian Shield. Summary - You can pick your own equipment, although items such as Ava's Accumulator are highly recommended. You need an item from every god except Bandos since you won't be going near his followers. Note: If this is your first time, you must bring a rope. Food - Other food like sharks also work fine but since you don't get into extreme situations at aviansies, pineapple pizzas are the best because they heal 22 life in 2 bites for only 500-600gp. Coins - It's always good to bring a couple of coins, because you will use that spot for money anyway. If you decide not to take any, leave that spot blank or replace it with a small fish like tuna. Bones to Peaches Tabs - More on them later, but that's what you need if you don't want to bank and earn more money faster. High Alching - You will need these if you want to spend the most time without banking. You could replace the lava staff shown in the picture with fire runes or a fire staff. Mithril Grapple - Not needed, but is recommended if you're not scared of bigger level aviansies and if you have 70+ range. It is less crowded at those spots which is the point of fighting higher levels. After you move the boulder/climb through the crack your running energy will drain and your stats will slowly be draining. Put protect from melee on and walk fast to the dungeon. If it's your first time, quickly speak with the dying soldier near the dungeon and use your rope on the hole. Go inside! Aviansies are at the south part of the dungeon. After you walk in, walk to the south. There will be level 68+ aviansies there. The black rectangle on the map is where you need to grapple pillar if you want to enter the higher level aviansies. There are level 73+ aviansies in here. There usually aren't a lot of people here either, so there's always space for you. Pick one of the areas (A red circle on the map) and run around killing aviansies. It's better to pick just one area rather than running around the whole dungeon. There is nothing special to know about killing them. The only important thing is never to let yourself have 110 Life Points or less because 110 is their max hit. They also drop bones. If you lose 200 Life Points (Example: you have 800 maximum Life Points, and you currently have 580 Life Points) eat a pizza/shark and replace it with a bone they drop. You will never have to heal more then once per kill. If you heal right away when you lose Life Points and when you have that kind of Defence bonus, it will be almost impossible for you to die. 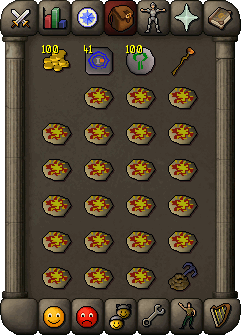 After you have no pizzas/sharks left and full inventory of bones use bones to peaches tab. One tab turns all bones into peaches. You could drop some of your stuff for a second, pick up some bones, and turn them all in peaches, eat the peaches, pick up your stuff and you just got extra Life Points for the same cost. It may sound like peaches are not good, but one peach gives 80 Life Points which is enough for 1 aviansies kill. Also, notice that there 4 law runes and 105 air runes that weren't there before. 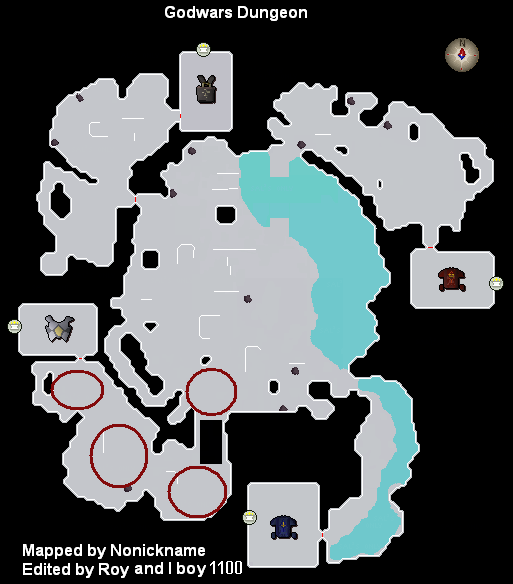 Aviansies will drop them, and I recommend you pick them up so you can have a Varrock teleport which you can use when you are done and ready to leave. This will get you to the Grand Exchange more quickly. Adamantite Bar Noted (4) - This is the main source of income, they drop them often and 4 at a time. It's not rare at all. And it's noted, letting you spend more time without banking. Swordfish - Sometimes they will drop 5 swordfish (Not noted); it's a rare drop. If you get it, replace all the bones with this fish. Level 3 Clue Scrolls; value is unknown until you solve it. Great way of relaxing from aviansies and maybe earning some cash. There are other drops like chaos, blood, and water runes, some nice herbs, and some other small/unimportant items. 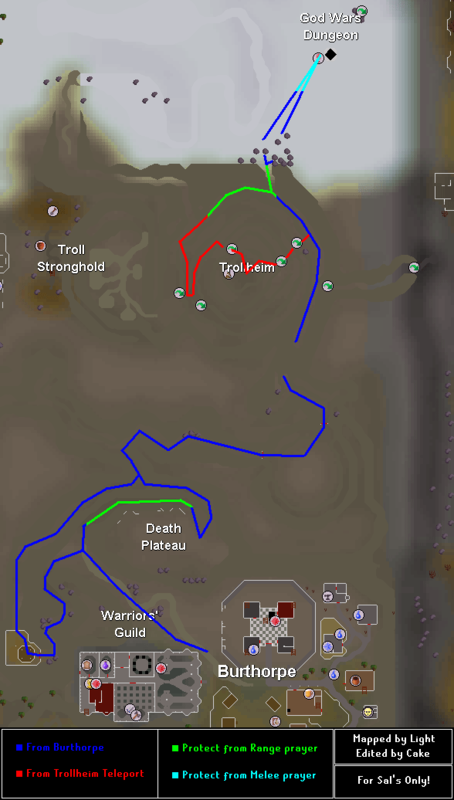 This is one of the most efficient locations to train range. Aviansies are of the most profitable monsters in RuneScape. After dividing the amount of money earned by the amount of kills it ends up being 3,000 gp (3k) per Aviansie. If you are still having any doubts just try one trip; they really aren't as hard as they sound! Please take note that these do become quite repetitive and therefore boring. This is a tanking guide. There is also short summary of prayer guide and some other tips in Aviansies section of God Wars Dungeon Guide. Just a reminder, you can't melee them and mage is too expensive, so range is the best choice.